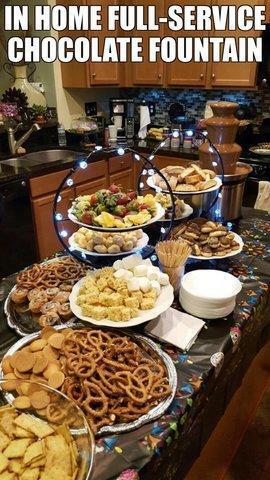 Our Full Service Chocolate Fountain Rentals are the most popular because when you book with Dayna's Party Rentals and Catering, you don't have to worry about the details. Let us do that for you! Sit back and relax while we assist you in creating a memorable event that your guests will always remember. If adding food coloring to white chocolate you must use "Oil Base food coloring"
• Fresh Strawberries, Bananas, Pineapples,Cherries, pick an assortment of 2 Seasonal fruits; customer takes home extra perishable items.